← 448 "Rednecks and Broomsticks"
The living room furniture is dancing to disco music until the Simpsons come in and Homer yells, "Hey!" The furniture returns to normal and the Simpsons sit on the couch without incident. "Oh Brother, Where Bart Thou?" is the 8th episode of the twenty-first season. It originally aired on December 13, 2009. Peyton Manning, Eli Manning, Cooper Manning, Smothers Brothers, Kim Cattrall, Huell Howser, and Jordan Nagai guest starred in this episode. "When Lisa tells Bart he'll never have the special bond that she has with Maggie because he doesn't have any brothers, he tries to get Homer and Marge to make him a baby brother, but when that doesn't work, he goes to the orphanage - where a young boy follows him home." The Simpson family stays at home during a blizzard. The weather is too wild to play outside and the power goes out, so Bart participates in a pretend fashion show put on by Lisa and Maggie. When he notices the bond shared by the two girls, Lisa suggests that he is jealous because he doesn't have a brother. 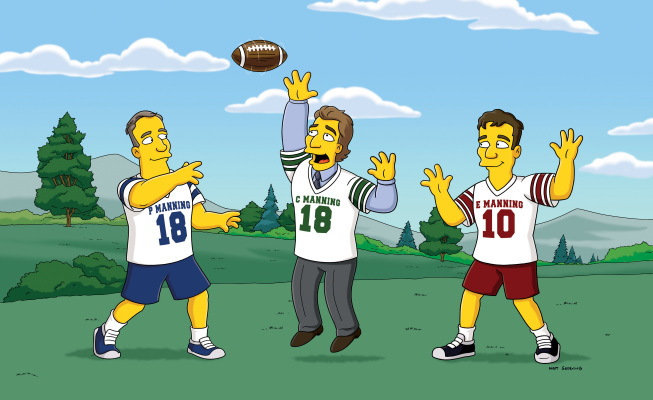 That night, Bart dreams about many famous brothers: the Smothers Brothers arguing, the Marx Brothers playing their trademark instruments, the Blues Brothers dancing, the Smith Brothers coughing, the Wright Brothers with their plane and bike, the Mario Brothers running into a tube, Cooper, Eli and Peyton Manning playing football, and Sideshow Bob and his brother Cecil flying kites. He awakes with the realization that he wants a baby brother. Bart consults with his friends, who advise him to trick Marge and Homer into making love. Bart's first attempt is to make them a romantic dinner, but Marge and Homer are too stuffed to feel amorous. In his second attempt, Bart leaves a kama sutra DVD in his parents' bedroom, but they hurt themselves when trying unusual positions. Frustrated, he seeks the advice of Nelson and the other bullies, who tell him to hide Marge's birth control pills. He switches them with Tac Tics, a parody of Tic Tacs (just as he did with Mrs. Krabappel's in "Itchy & Scratchy: The Movie") and throws the Tac Tic container (which now contains birth control pills) out the window, where it is found by Nelson. Marge catches Bart tampering with her pills and he confesses that he wants a brother. When Marge explains that she and Homer only wanted three children and that a fourth attempt could result in another girl, Bart goes to the local orphanage. He is turned away because he is too young, but a young boy named Charlie follows him home. Bart and Charlie do brotherly things together, including playing pranks on Principal Skinner and hanging out at the Kwik-E-Mart. When Lisa insists that Charlie be returned to the orphanage, Bart disregards her and takes Charlie to see a horror movie entitled "Sever V." The movie terrifies Charlie, which makes Bart realize that being a brother requires responsibility. On their way back from the movie, Chief Wiggum tries to apprehend Charlie, but the two boys escape and hide in a snowbank. Meanwhile, Nelson has become increasingly emotional and weepy from eating Marge's birth control pills. Back in the snowbank, Lisa pleads with Bart to do the right thing and let Charlie be legally adopted by another family. When the children are sealed in the snowbank by a snow plow, Bart and Charlie urinate out of the tunnels, much to Lisa's disgust. Charlie is later adopted by a family with six girls. Homer sees that his son misses Charlie, so the two watch a scary movie together.